Sharknado | Style Weekly - Richmond, VA local news, arts, and events. 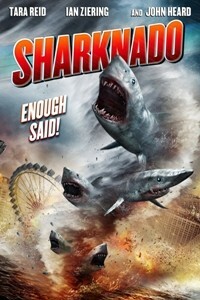 NCM Fathom Events and The Asylum are proud to bring the "made-for-TV guilty pleasure", Sharknado, to select cinemas nationwide for an exclusive midnight showing! In addition to the big screen presentation of Sharknado, this epic one-night event will also feature never-before-seen footage including a behind-the-scenes featurette and a gag reel!